The ground floor of the Moody Center is mostly glass, while the upper level is clad with dark gray bricks and has a reduced number of irregularly sized and spaced openings. Photo by Peter Molick. The west facing elevation with its projecting “lanterns” and partial concrete terrace. Photo by Peter Molick. The building turns a nearly blind brick wall to the old Rice Media Center, which now houses a center for film and photography. Photo by Peter Molick. The “lanterns” suggest but do not quite define outdoor courtyards around the building. Photo by Peter Molick. The main public entry lobby flows into a double height gallery with a spung wood floor for dance performances. Photo by Peter Molick. 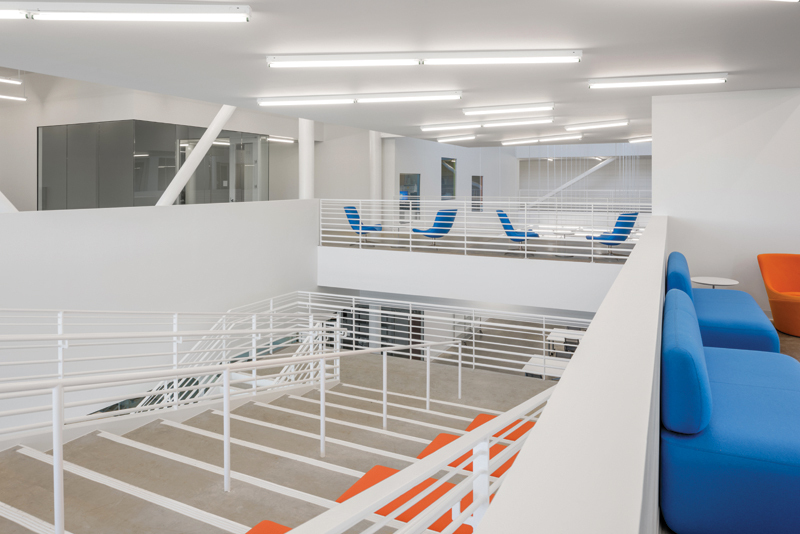 A double height space at the center of the building, connected by a generous stair, houses an open studio space for students. Photo by Peter Molick. The Rice University campus, like its host city, Houston, has been transformed in spurts, with furious but sporadic building booms. Unlike Houston, Rice has mostly followed a formal plan. Its biggest boom lasted from the late 1940s through the early 1970s, during which time 30 new buildings appeared. The latest growth period began in the late 1990s under president Malcolm Gillis and has continued under current president David Leebron. With the latest new-building count at 30 (including the Rice Opera House, in the design phase), the postwar boom has been matched, and there are no signs that the current one is winding down. Indeed, a common quip at Rice is that there are more buildings than there are students. As with all construction booms, the results are mixed: There are some great buildings, some terrible ones, and a lot in between. 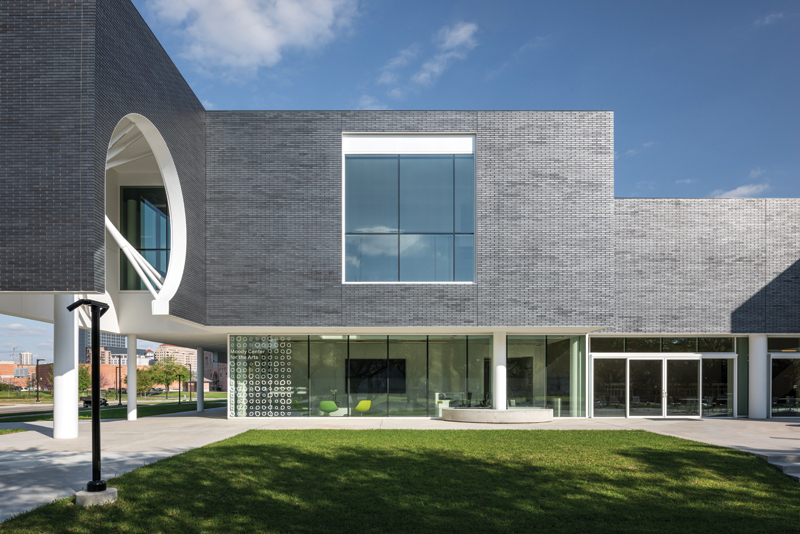 The newest facility to open at Rice is the Moody Center for the Arts, a two-story, 52,000-sf building on the southern edge of campus designed by Los Angeles architect Michael Maltzan. Its ground floor is largely glass, while the second floor hovering over it is mostly solid, clad with metallic gray brick and punctured by relatively few — but large — openings, irregularly shaped and spaced. 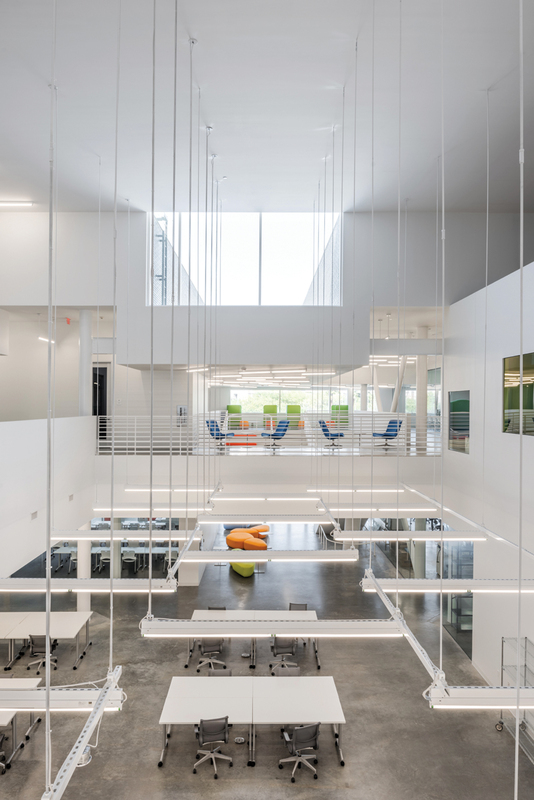 The contrast between the two floors evokes the shapes of existing campus buildings — rectangular bars of varying dimensions — and the sensation of passing through Rice’s dense gray-green canopy of live oaks. 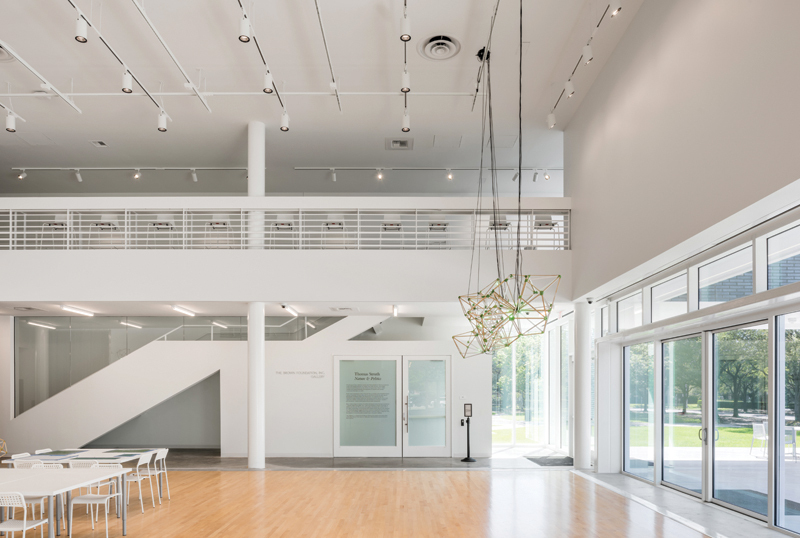 The Moody Center, committed to collaboration among the arts, sciences, and humanities, comprises the secured, museum-like, double-height Brown Foundation Gallery; the open, double-height Central Gallery (which has a sprung wood floor for dance); and three smaller art exhibition spaces: the Reception Gallery and two media arts galleries. Other dedicated areas include the Lois Chiles Studio Theater, (a black box theater), studios, labs, classrooms, a library, a slew of audiovisual editing rooms, different types of fabrication shops, and some unprogrammed open spaces. The Moody’s multidisciplinary arts-focused program reflects a trend in institutions of higher learning toward having special facilities designed by prestigious architects. 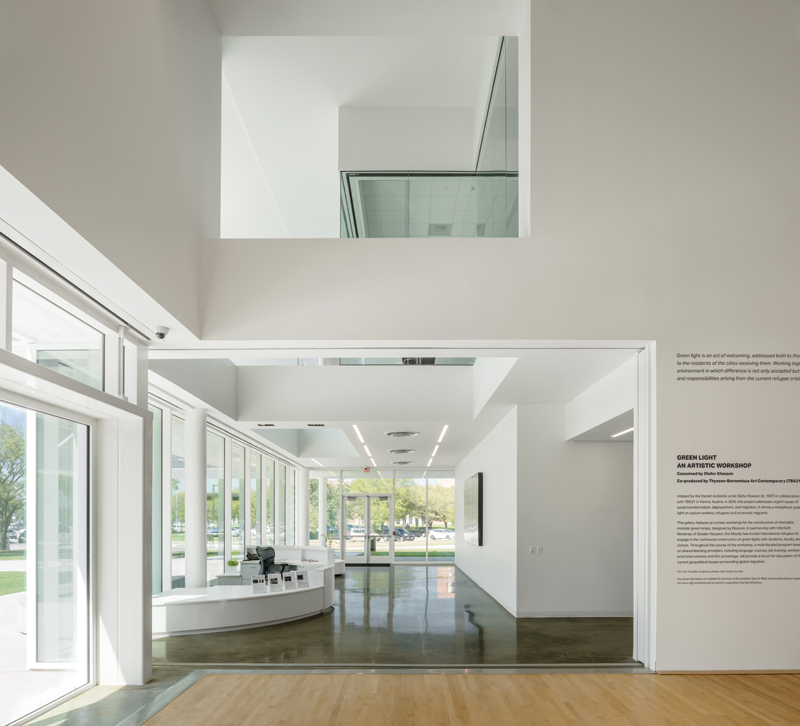 Examples include the Granoff Center for the Creative Arts (2011) by Diller Scofidio + Renfro at Brown; the Stanford Arts Institute, housed in the McMurtry Building (2016), also by Diller Scofidio + Renfro; and the Lewis Center for the Arts at Princeton, whose new mini-campus, by Steven Holl, is scheduled to open in October 2017. 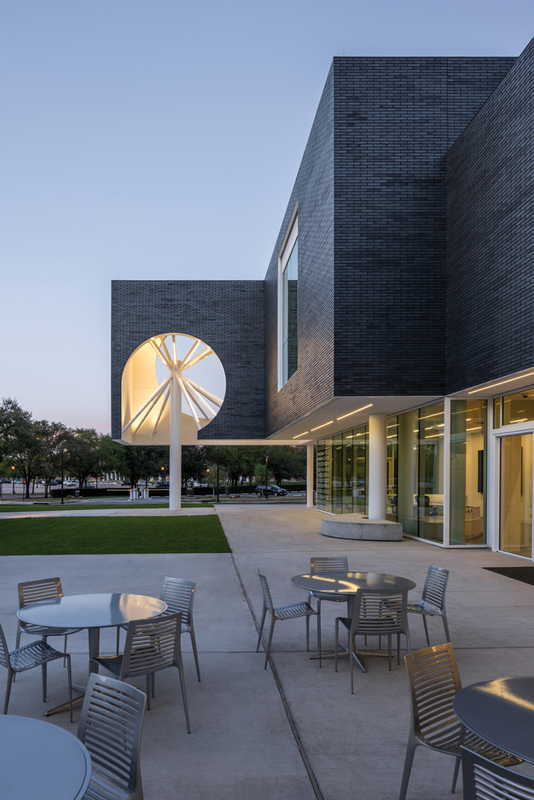 Closer to home, there is the Cynthia Woods Mitchell Center for the Arts at the University of Houston, which was remodeled in 2005 by Lake|Flato. Rice already has two multidisciplinary programs: the Oshman Engineering Design Kitchen, remodeled in 2008 by Stern and Bucek, and the BioScience Research Collaborative, designed by SOM’s San Francisco office. In the Rice context, the Moody Center’s novelty is in its focus on the arts. Although arts and humanities have been integral to Rice’s curriculum since its foundation, the school remains best known for science and engineering. One of president Leebron’s stated goals has been to reduce this disparity. 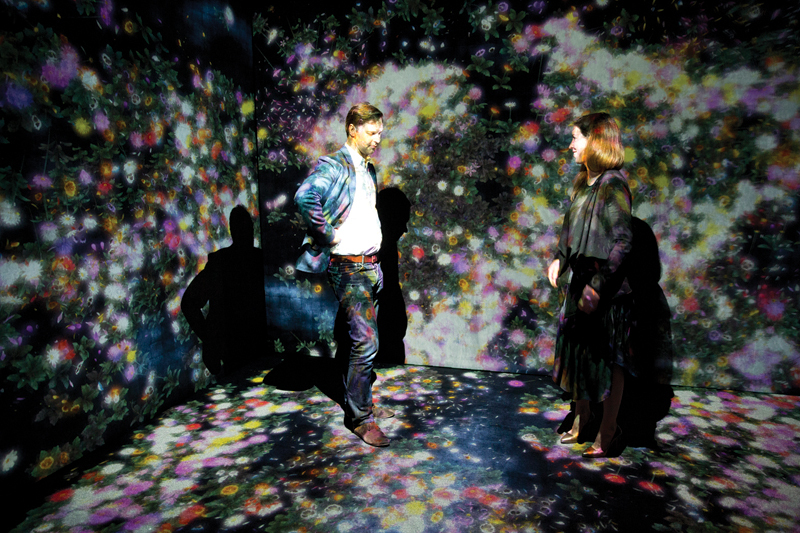 About five years ago, the private Galveston-based Moody Foundation approached Rice University, intending to fund a brick-and-mortar project for the arts. 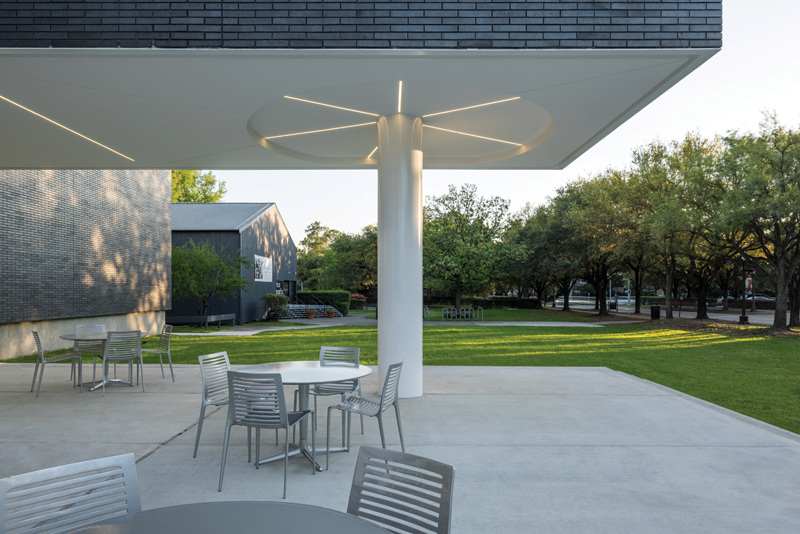 It ultimately gave two thirds of the Moody Center’s $30 million budget, with philanthropist and Rice alum Suzanne Deal Booth (who commissioned James Turrell’s “Twilight Epiphany” and its surrounding pavilion by Thomas Phifer) proposing architect Michael Maltzan for the new center and endowing the executive director’s position. The Moody Center sits at Rice’s Stockton Street entrance, in the middle of an unplanned athletic sector that sprawls along the campus’s previously neglected southern edge. The university’s goal seems to be to reclaim this sector as a cultural center, making use of its proximity to the vast public parking lot that surrounds Rice Stadium. In 2014, a new building for the Glasscock School of Continuing Studies, designed by San Antonio architects Overland Partners, opened across the street. The new musid and opera building is scheduled to be built nearby. In the past, Rice’s most ambitious multidisciplinary arts program was the Institute of the Arts. 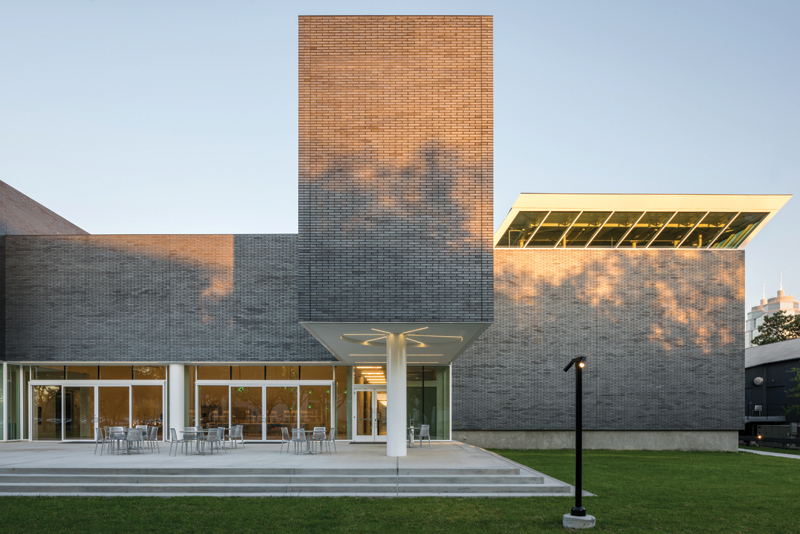 It was created in 1968 when Dominique and John de Menil relocated their art collection, library, faculty, and staff from the University of St. Thomas to Rice following disagreements with the St. Thomas administration. The Menils immediately commissioned Howard Barnstone and Eugene Aubry to design what were grandly named the Rice Museum and the Rice Media Center to house their operations. In reality, these were unadorned twin warehouses clad with corrugated galvanized sheet iron. The former Rice Museum building was repurposed as offices for the Glasscock School, and the Media Center was taken over by the art department as its center for film and photography. In 2014, the Rice administration weathered vocal public criticism when it ordered the demolition of the Rice Museum, vacant after the Glasscock School relocated, rather than rehabilitating it as much-needed studio space for the art department. The site of the Rice Museum remains empty, and there are no plans to build anything there. The planning of the Moody Center seems almost as casual as that of the Rice Museum and Rice Media Center, in their day. The search for its executive director did not begin until the end of 2014, at which point architectural design had been progressing for nearly two years. According to Alison Weaver, who was hired as executive director in the summer of 2015 and formally assumed her position that September, design was about 70 percent complete when she arrived. The building, at first glance, is striking and seductive — almost as if its main aim were critical recognition. Upon closer examination, however, it seems more like an exercise in form-making than an attempt to create meaningful spaces. The architects say the irregular profile of the building represents a conglomeration of the mostly long and narrow buildings on campus. In reality, the Moody Center is more like a box (in which a surprising number of offices lack exterior windows) than like one of Rice’s archetypal porous bar-like buildings. This disconnect is further emphasized by two-story “lanterns” that project from the building on several sides — suggesting, but not quite conveying, a sort of outdoor courtyard at the ground level. On the second floor, they provide mostly inaccessible open space to be viewed through windows. 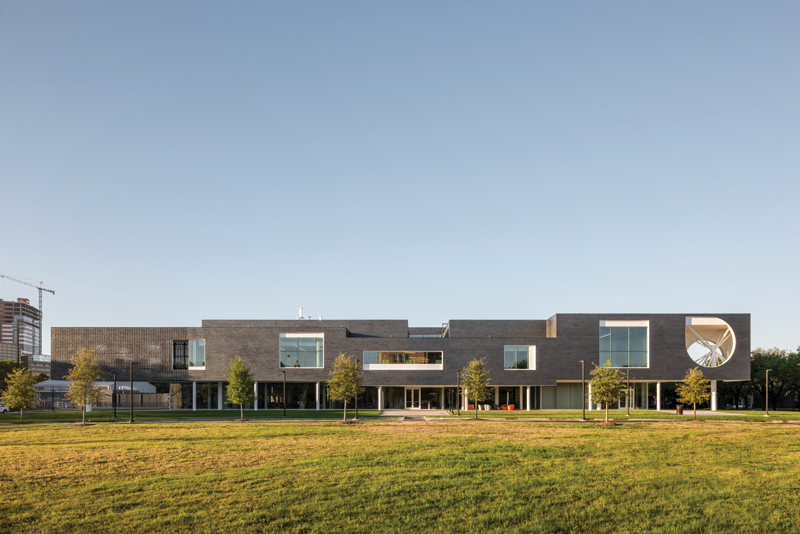 Unlike Rice’s best buildings, the Moody Center does not integrate itself in any systematic way with the surrounding structures or landscape. Its closest neighbor is the adjacent Rice Media Center, which the architects have addressed with a nearly blank brick wall, in stark contrast to the mostly glazed ground level walls of its other three sides. The space between the two buildings feels like a back alley. A concrete terrace on the Moody’s western side, aligns with the front of the Media Center, stopping well short of connecting the two buildings. Sidewalks and plantings between the buildings are haphazard, and there seems to be no plan to reorganize them. The Moody Center’s next-nearest neighbor is Reckling Field, Rice’s baseball stadium. In this direction, the architects have placed loading docks. A new street cut parallel to the front of the Moody leaves an empty triangular space between it and College Way, the main internal circulation path on campus, as well as between it and the future music building. So far, it is hard to imagine that this nascent arts and culture precinct will coalesce with the rest of the campus in an architecturally resolved manner. When I asked the campus architect, David Rodd, how the Moody Center fits in with the campus master plan, he replied, “Rice does not have a campus master plan. Rice officially abandoned it several years ago. Rice now has a dynamic, 3-D modeling toolset that gives us the ability to iterate any number of future campus growth scenarios without committing to a static plan.” This suggests that Rice is no longer planning meaningful spaces, but rather just reacting to opportunities for expansion: The oddly disconnected Moody Center seems to embody the new attitude. Beneath the appealing veneer of an undeniably attractive but aloof building, a series of disjointed spaces remains, spaces that fail to relate to the rest of the campus. The gulf is compounded by the Moody’s vague program, strenuously not a part of the art department, and yet tasked with bolstering its place on campus and validating the Rice administration’s perplexing decisions regarding existing arts resources. The carefully considered master plan at Rice, whose first version was created in 1910, and which has been continuously revised, was a robust framework that guided development and led to a unified and ordered environment that just felt good, in distinct contrast to the urban mess of Houston’s sprawl. It is discouraging to think that Rice’s longtime resistance to Houstonization seems to be fading.